The power of cooperation, corporate leadership, and creating a positive culture were some of the key discussion points at this year’s Food and Grocery Council annual conference at the Sheraton on the Park hotel, Sydney earlier this month. The three-day conference was an opportunity for members of the industry to learn more about current market trends and branding strategies. “The conference was a platform for us to connect with key stakeholders from the industry to understand the type of on-the-job training that works for their businesses. 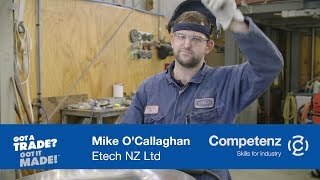 Some of the key areas of interest were training programmes in sales and retail, occupational health and safety, and workforce development,” says Competenz National Manager, General Manufacturing Andy Bunny who attended the conference with Competenz CEO John Blakey, General Manager, Industry Training Jim MacBride-Stewart, and Business Development Manager Kirk Spinks. Leaders in the food and beverage industry listened to a panel of industry leaders and guest speakers such as Mark Weldon (Group CEO MediaWorks), Mark Powell (CEO for The Warehouse Group), Barbara Chapman (CEO ASB Bank), and motivational speaker Peter Davidson who shared his heroic story on rescuing eight men during the 1998 Sydney to Hobart Yacht Race. As the gold sponsor of the conference, we’re proud supporters of the food and beverage industry and are actively working with the industry to grow and develop training opportunities for their staff.